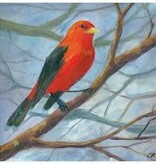 The addult male summer tanager is entirely bright red. Females and immature males are bright yellow-green—yellower on the head and underparts and slightly greener on the back and wings. The bill is pale. Molting immature males can be patchy yellow and red. Summer Tanagers tend to stay fairly high in the forest canopy, where they sit still and then sally out to catch flying insects in midair, or move slowly along tree branches to glean food. Males have a sweet, whistling song similar to an American Robin; both sexes give a distinctive pit-ti-tuck call note.